The advantage of using CorpNote to send your invitations is your guest list will automatically be created for you and you will see who views your invitation, but sometimes you don't have a specific guest list. This tutorial details how to link directly to an invitation eCard and the event response form from your own email program, website, blog, or social media. Go to Invitations > Manage Events in the navigation. 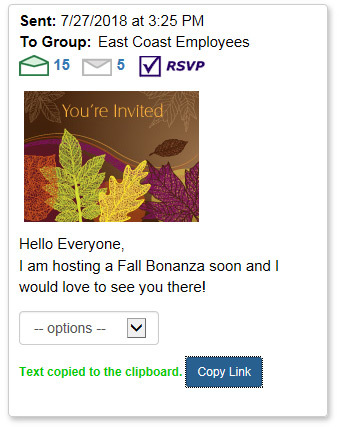 The link to the event response form is now in your copy buffer and the screen will say "Text copied to the clipboard"
If you are linking directly to an invitation eCard, you will not have as much detail as to who is viewing your invitation. You will still see how many times it was viewed but each view will be marked as 'anonymous'. We recommend adding a comment to each eCard you use the direct link.. In your 'sent cards' bin, find the invitation eCard you linked to and select 'Your Comments' from the drop down menu. Add descriptive comments that will help you remember where you posted the link to this eCard. Only you will see these comments. You will not be able to use the 'Invitation List' feature with either of the above methods.